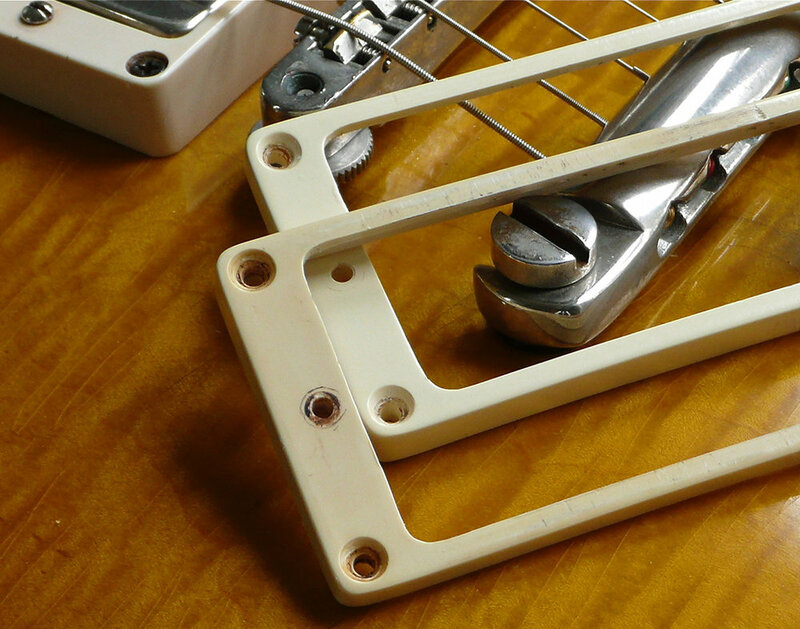 The famous 'Over the Pond' or 'English' rings, much discussed on the two main Les Paul Forums. We are the originators of these rings. All 'OTP' rings come Vintage Haven. Two years in the making, these surrounds are manufactured using moulds taken directly from original 1950's M69's. They are produced in the identical plastic the originals were made from. This material is very hard to source and very difficult to work with. They have the distinctive smell and feel and will age naturally just like the originals. We spent a great deal of time and effort getting the colour right. We have checked test samples against dozens of genuine rings. The perceived correct colour is probably far paler than the majority of 50 year old M69's actually look today. When viewing photographs of original 'Bursts and Gold Tops the plastic parts bleach out and look much paler. We have made direct comparisons in-hand with real M69's and consulted with several Vintage dealers and collectors whose opinion I greatly respect. No two pairs of 50 year old genuine M69 rings are exactly the same colour today. The definitive correct colour is impossible to determine. We decided to go with two mixes, one a 'Bone' and one a slightly more 'Cream' version. Either of these colours gives a very authentic look and we believe they are both very close to the colour the originals were when new. A third version is available which we call 'Vintage' these are very slightly pink/tan. Much criticism has been made of the 'false limb' colour that some of the Gibson Historic reissue rings have. Despite the Historic rings being so disliked they are actually quite close in colour to some original M69s. It is the texture and translucency of the plastic that looks wrong. Several 'Burst' owners and Dealers have indicated our 'Vintage' colour as being their preference. At the end of the day its your guitar and your choice. Each pair are hand finished and aged to your requirements - no two pairs are exactly the same. Only available in small quantities. The colour and material are the most authentic currently available. Replica M69 rings: £190 per pair: Available in Bone, Cream or Vintage tint. NOS - Light aged - Medium aged. A set of vintage correct mounting screws included. We have a bespoke matching service for owners requiring a replacement pair or single for an original guitar. Please contact us for details. Please indicate if your order is for a Gold top or a Sunburst (we usually add red aniline bleed to the bottom edge of the front ring on a sunburst set).